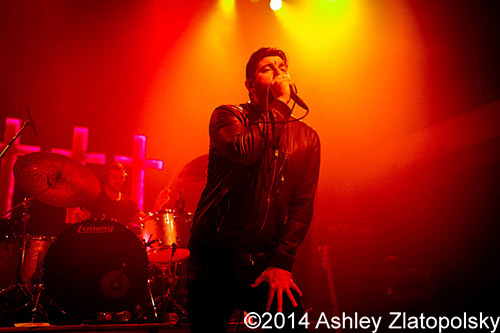 Crosses made their Michigan debut at Pontiac’s Crofoot Ballroom, one of only four stops on a weeklong tour. Other cities on the run include St. Louis, MO, Nashville, TN and Chicago, IL. Fronted by Deftones vocalist Chino Moreno, Crosses is a mellower side project that embraces a softer version of the singer’s typically aggressive style. Unlike Deftones, which focuses on heavy guitar riffs, screams and hard-hitting drums, Crosses emphasizes Moreno’s wide vocal range, supported by a warmer, more electronic background. Whereas Deftones’ recent Michigan stops have included festival, arena and pavilion shows, Crosses played to a more intimate crowd at The Crofoot. Moreno signed a record for a fan from the stage, noting out loud that he didn’t recall signing anything before whilst performing. The front man joked around with the audience, giving a sense that the band was enjoying playing in such a close setting. He even made light of the fact that he was drinking apple juice while other band members drank cups of whiskey. Crosses ran through material fast since the band only has two EPs and one full-length record. The third album, not yet released, contains material from the first two EPs, as well as brand new songs that were previewed throughout the tour. What was scheduled to be an hour-and-a-half long set ended nearly 30 minutes early, an unsurprising move considering the shortage of tracks to fulfill the timeframe. Fans were not disappointed, however. Highlights of the band’s performance included covers of “Goodbye Horses” and “Mandatory Suicide”, as well as original tracks “The Epilogue” and “Telepathy”. “Telepathy”, in particular, was a huge crowd pleaser, as it was the most upbeat song of the night (the tempo was even kicked up a few notches for the live version). Crosses had just as much fun as the audience, going all out for that number and smiling ear-to-ear.